Red Frisee Mustard has heavily serrated oak leaf-shaped deep purple leaves with a pale green stem. It has a pronounced mustard flavor and a crisp, crunchy yet delicate texture. Use raw in salads, wilted, sautéed or braised as a vegetable component. Red Frisee Mustard pairs well with other greens and compliments long-cooked meats as well as delicately prepared fish and seafood. 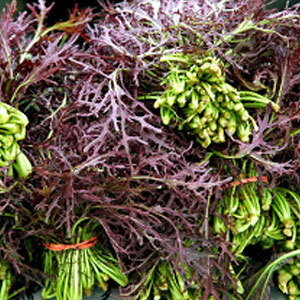 Red Frisee Mustard is a Japanese heirloom variety mustard green used in Asian and Middle Eastern cooking.